Located high above the pretty spa town of Ax Les Thermes, and accessed via gondola or a mountain road, the ski resort of Ax 3 Domaines is a hidden gem. 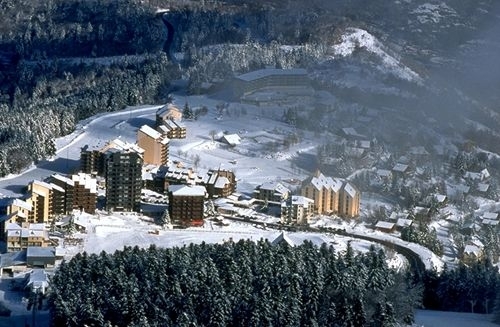 Situated in the Ariège department of the Pyrénées and close to Andorra, the resort is made up of three ski areas with over 80 km of trails and wide open spaces. Bonascre was the first of the three ski areas and it is the entrance point to the Ax 3 domaines ski area. 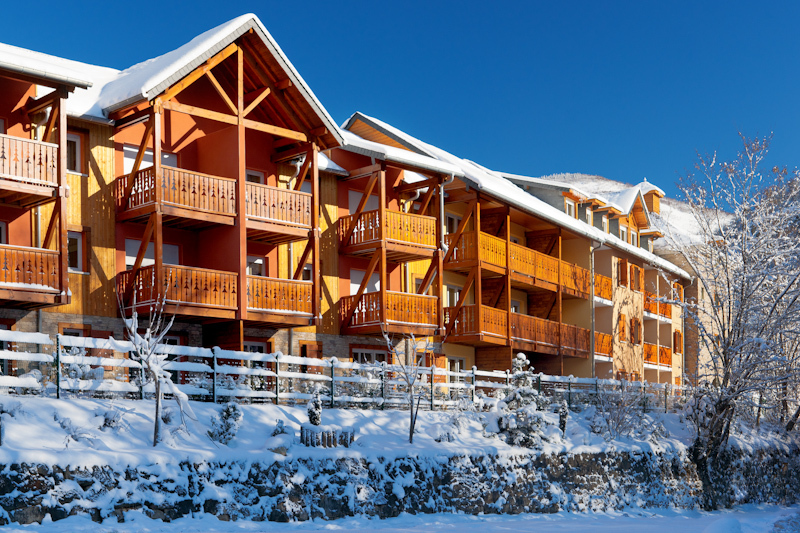 Ax 3 Domaines offers great skiing and plenty of activities for groups and families alike - the famous Les Bains Couloubret is a must. In 1952 the Ax Municipal Council took the decision to create a ski resort to boost the town of Ax-les-Thermes during the long winter season. The resort was inaugurated in December 1955 with the completion of the lift up to the Bonascre station - the mountain road took a further 8 years to build! It was only in 2002 that the village of Ax les Thermes and the ski area were connected via the 16 person cable car that runs from the Ax Valley up to the heights of Ax Bonascre. Ax 3 Domaines can be also accessed from the same mountain road which leaves from the pretty Pyrenean spa town of Ax Les Thermes. A shuttle bus runs from outside the Tourist Office of Ax Les Thermes, visiting both areas (see Access section for more details). Down in the valley, the charming old village of Ax Les Thermes stands on the confluence of the Oriège, Ariège and Lauze rivers has a friendly, welcoming and relaxed atmosphere and a rich history. The town is a pleasure to wander around and has a good selection of bars, restaurants and general amenities - there is always something to do. Ax is perhaps most famous for its thermal baths, Les Bains Couloubret, with its sulphurous hot springs (25-78°C), of which there are about sixty. The waters were originally used by the Romans and it is claimed that they are able to treat rheumatism, skin diseases, and other maladies. The springs were developed in the medieval period in order to treat soldiers returning from the Crusades afflicted with leprosy. The baths became very popular, as did those in other areas of the Pyrenees during the nineteenth century when the spa tourism industry developed in the Victorian era. The Bassin des Ladres (Lepers' Pond), built by Roger, Count of Foix, during the reign of Saint Louis can be found in the centre of the town and is fed by hot springs supplying water from the ground at a temperature of 77°C. The best known fountain is the "fountain of cannons". Every year on St John's Day, the Axéens, having been daubed with ashes, bathe in the Bassin des Ladres for fun and celebration. Throughout the year, the resort hosts many major international sporting events including the “Atitoy Ternua” at the end of January. There are also daily entertainment organised at the foot of the ski slopes for family and friends alike. Events include sledging, slalom courses and even Rugby on the snow just to mention a few. The friendly and helpful Vallees D’Ax Tourist Office is open every day during the winter season, 08:30 – 19:00. Their comprehensive website is full of useful information, tips and suggestions. 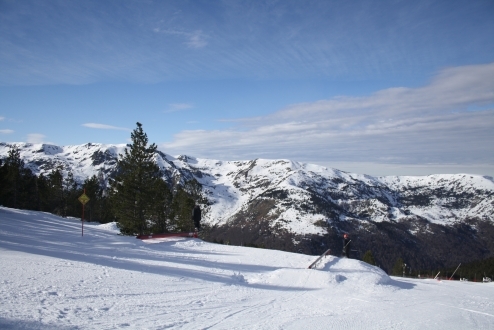 Ax 3 Domaines ski area open: 28/11/15 – 02/04/16 - Provisional. Take part in a hair-raising snake like train down the 4.5 km of blue piste through the pine trees. Seated in your sledge with your legs placed in the sledge in front of you begin the descent from 2000, down to 1400, winding down the long run. A fun filled event with whoops and laughter. If you feel you could do with a spot of help getting started or would simply like the knowledge of a local guide why not try one of the organised snow shoe walks which include forest walks and night time escapades! Azimut 360. Impasse Emile Viguier, 12100 Millau. Ax Valley. Booking: Available daily upon reservation: Tel: +33(0)681 265502. Email: azimut.savy@gmail.com. Take a mountain bike out onto the snow – you would think it impossible but thanks to the “Ktrak” system (a small ski at the front and a caterpillar track at the rear) you can ride you environmentally friendly skidoo on the slopes. There is a 600m descent route accessible from the ski area and this will give you plenty of time to take control of the bike and churn up the snow. Some of the local farmers in the Ax valley open up their farms to show you the joys of farming in the Pyrenees. At the end of the day (from February onwards) this free evening out is great fun for all the family. La Ferme De Berbescou: Located in the small village of Lordat which is a 2o minute drive from Ax Les Thermes is the family run farm of Berbescou. Here, in the evenings from February onwards, you can help to feed the goats and to sample fresh goat’s milk. Every evening from 17.00 (except Tuesdays). La Ferme De Quié: Located just a stone’s throw from Cabanne at Verdun, Philippe takes you on a tour of the farm where you will discover this “Gasconne” cow herd with its new born baby calves feeding on mum. He will tell you all about his passion for cow rearing in the Pyrenees Mountains. For big and small alike, this route of discovery following 14 signposts through the town of Ax Les Thermes is a stroll through back in time. To help you there is a small guide available at the Tourist Office. 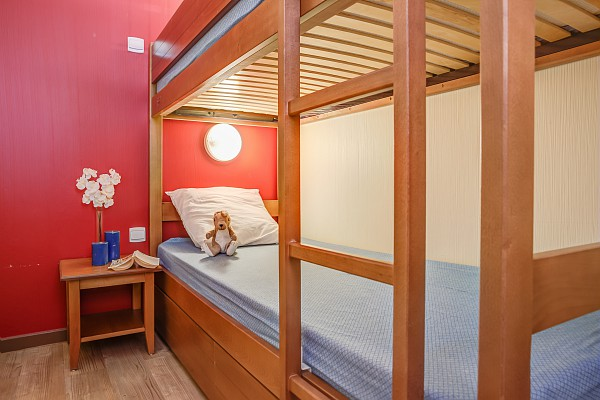 Ideally located at the foot of the slopes, the 3 Domaines nursery welcomes children from 3 months to 6 years of age. Morning, afternoon or full day care is available at the following times. Bookings are essential. Opening times: Monday – Friday, 09.00am to 16.45. 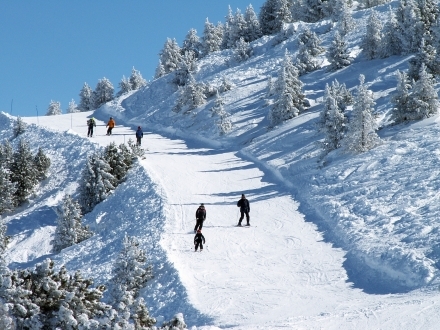 Ax Les Thermes and its valley offers a wide range of additional winter activities. The must do is the “Bains Du Couloubret” Spa and Well-being Centre. There is also a town casino, the nearby observatory at Forgues, as well as local cavern and farm visits. Ax has a wealth of local heritage and some pretty amazing historical sites to visit, even during the winter months. The “Discovery” walks showcase the heritage of the area whilst adrenaline-filled on piste evening activities top it off. Thermal spas are typical of most of the Pyrenean ski resorts and are one of the must try experiences. Open all year, the Bains Du Couloubret Spa and Well-being Centre offers a range of treatments using its natural mineral rich waters. The spa is a great place to relax and its 3000 sq. metres of well-being and relaxation areas comprises thermal baths which vary in temperature from 33 and 38 degrees. Unwind in the Jacuzzi or enjoy a deep massage thanks to the swan neck fountains that gush with high pressure water. Throughout the pools there are underwater hydro-massage jets and one the second floor the two outdoor pools allow outdoor bathing in 35 degree pool whilst the exterior temperature is crisp and cold. Enjoy the hot dry air of the saunas and relax in the warm humid hammams. To finish off, why not book yourself in for a relaxation or sports massage - ready to get back on the slopes tomorrow. Opening times: All year round, daily. School holidays only: Mon – Thurs & Sun: 10.00 – 19.30; Fri – Sat: 10.00 – 20.30. Rest of the year: Mon – Fri: 14.00 – 19.30; Sat – Sun: 10.00-20.30. Click below for a video of the thermal baths. Discover the Nordic Ski Areas of Chioula and Beille Plateau in the Ax Valley. Chioula Nordic Area is just 10km away from Ax Les Thermes and at a modest altitude and has a mountain refuge for those wishing to overnight. It offers 60km of cross country trails set in untouched nature as well as 10km of snow shoeing trails. Beille Plateau Nordic Area is also an option but is a little further away, located 30km from Ax Les Thermes. This area is distinguished by its immense high mountain plateau suspended at an altitude of 1,800 and 2,000m. Here you will find 70km of cross country trails and 30km of snow shoeing trails. Snowshoe has been used since the dawn of time by travellers, huntsmen and farmers to cross the snowy terrain of the Pyrenees. Snow shoes are a wonderful way to enjoy the mountains in the winter whether alone or with family and friends. Great fun for big and small alike. Come and balance on the mountain ridges and pick your way through the mountain terrain. 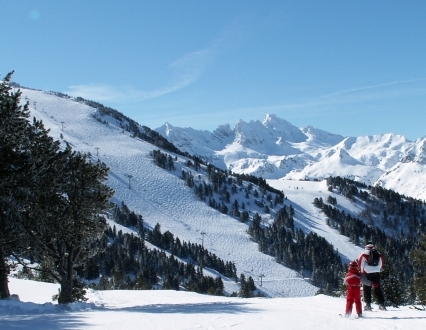 Venture into the heart of the resort and afford yourself a 360 panoramic view of the Pyrenees. Take advantage of the ski lifts and ascend to the heart of the ski resort and then begin your adventure, playing amongst the peaks just like a pro, 0% effort, 100% adrenaline rush. Hiking through the snowy back country with your seal skins tightly secured, you feel at one with nature and the elements. Away from the crowds and the hustle and bustle of city life, the silent mountain spaces give you the impression of being the only one on the mountain. 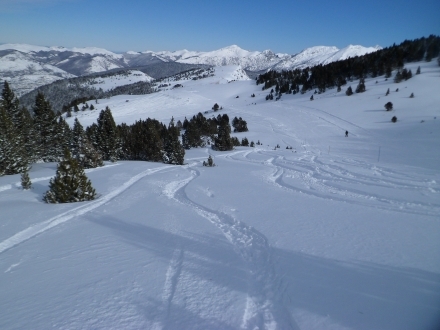 The Ariège Mountains lend themselves well to ski touring and there is an array of routes open to you to explore with your guide. All this means that your thirst for the great outdoors will be quenched. Take part in a hair-raising snake like train down the 4.5 km of blue run through the pine trees. Seated in your sledge with your legs placed in the sledge in front of you begin the descent from 2000, down to 1400, winding down the long run. A fun filled event with whoops and laughter. Booking: Daily during French school holidays (February, Christmas and New year); Wed/Fri/Sat: other periods. Meeting Time: 16.15 & 18.15 (Daily during French school holidays; Wed/Fri/Sat during other periods). Price: Adult/22€. Child (-12 years)/18€. Tandem discovery flights available in the mornings throughout the year. Take off with your skis on from "la Tute de l'ours" or the Saquet plateau for a flight over the pine forests and slopes of Ax. You will learn how to fly and glide thanks to your new wings and a pair of skis. These mini paragliders which mesure 8 x 14 square metres allow you to ride the snowy inclines. The philosophy is the ride as close to the slope as possible whilst finding new ways of gliding. Cinema Casino, Allées Paul Salette, 09110 Ax-les-Thermes. The casino is located in the centre of Ax Les Thermes and has a baroque style to it. The large games room has a Spanish theme to it and has some superb frescos. On Friday and Saturday there are musical evenings on the huge terrace where cocktails are also served. Open daily from 14.00 – 01.00 (02.00 Thurs & Sun; 03.00 Fri & Sat and National Holidays). ID necessary for entry. Located at the end of the Orlu valley, in the small hamlet of Forges is a unique museum. The 1.5 hour loop around the museum is a mixture of science and poetry and helps you to understand the mountain setting and its actors. In the entrance hall, an information point labelled “International year of the mountains” is for those interested in the National fauna Reserve of Orlu and its research carried out in this area. Opening Times: Monday to Friday during the French February school holidays. The Pyrenees is famous for its underground caves both historical and natural in their classification. Ax Valley is no different and a lot of the caves can be visited in winter during the February school holidays as well as summer. Niaux Cave: This cave is renowned worldwide for the quality of its prehistoric paintings which have been remarkably preserved over time. Cow Cave: This cave, with its paintings of cows, it bears witness to the prehistoric hunters that roamed these areas. Bédeilhac Cave: This cave is famous for its wealth of clay reliefs – a unique phenomenon. Lombrives Cave: Vast. This cave is simply the largest in Europe. At the forges of Orlu you can turn your hand to pottery at one of the workshops organised by Leo in his own personal workshop. There is a year round exposition of his work on view and individual or group lessons can be booked. If you love local heritage and culture or you just love walking then you will love this little booklet available at the Tourist office. Entitled “D’un Village à l’autre” (From one village to the next), it has detailed routes of walks in the area showcasing the small villages, forests and streams. Easy to follow (but in French), it is a wealth of information. On a bright winter’s day, certain walks featured in it are a joy to follow whilst others, at perhaps a higher altitude, will have to wait until springtime when the snow has cleared. During the XI and XII centuries, Roman art was extending over Europe at a magnificent rate. All Roman art became sought after: the architecture, the quality of the materials, the aptitude of the craftsmen, the artistic forms that gave the sculptures a life-like appearance. These Roman churches in the Ax valley became treasures, protected during wartime, tucked away in their green enclave of the heart of the Pyrenees. They represented a remarkable heritage – simple and magical. The rustic charm of these churches is equalled in the authentic small villages that surround them and the picturesque mountain roads that rise up to meet them. The Route des Corniches, is a cliff road that runs between Ax les Thermes to Bompas. It acts as a natural observation point for the mountain peaks, the valley and three of Roman church gems in the Ax valley. The churches of Sainte Marie–de-Vernaux, Saint-Saturnin-d’Axiat and Saint-Martin-d’Unac are all visible from this route. Passerelle Culture organises trips to the area during the French February school holidays. The ski area of Ax 3 Domaines has 2 mountain restaurants for you to choose from on the slopes which are both accessed by the “Saquet” Cable car. There is also a selection of restaurants at the base of the lifts in the area of Ax Bonascre. Plenty of choice ranging from fast food to relaxed dining with great views of the slopes and ski resort above. Plateau De Bonasce. Tel: +33(0)561 646464. Located at the bottom of the ski lifts in the Bonascre area, this is a fast food restaurant with a large sun terrace at the foot of the pistes. A popular restaurant with locals and tourists alike located at the bottom of the ski lifts in the Bonascre area. Plateau De Bonasce. 09110 Ax Bonascre. Tel: +33(0)561 643125. Located at the base of the lifts in the Bonascre area, this restaurant is open for lunch and evening meals and offers set menus and A La carte food. Choose from grilled meats, local specialities and homemade desserts. Le Roc Blanc, Plateau De Bonasce. 09110 Ax Bonascre. Tel: +33(0)561 643125. Plateau De Bonasce. 09110 Ax Bonascre. Tel: +33(0)561 019709. Located at the base of the lifts in the Bonascre area, the restaurant offers creative cuisine in a friendly setting. Has set menus from 14 euros and burgers with porcini mushrooms. As well as a mean entrecote steak with Roquefort sauce. This brasserie restaurant on the slopes doubles as a bar in the evenings. The town has a great selection of restaurants showcasing many different cuisines. French Gastro cuisine restaurant selected by the “Guide Michelin” with outdoor terrace. Has set menus and A La carte menu. Closed Mondays. A creative Crêperie owned by an Alsatian couple. The portions are huge and the food is good. Pancakes with sausage and caramelised onions, mushrooms, spinach, or even Confit Duck!! For desert and Black forest sweet pancake. Themed evenings and culinary discover evenings. Casino restaurant located in the centre of Ax Les Thermes. Traditional and gastro food and Brasserie style. Open evenings only. Traditional restaurant with an outdoor terrace. Traditional restaurant with local food and ingredients. Wine cellar and outdoor terrace. Pizzeria and Grill with a wine cellar and selection of bottled beers. Terrace. Traditional restaurant with an outdoor terrace. Bar in the evenings. Traditional restaurant with outdoor terrace. 2, Rue Joseph Rigal, 09110 Ax Les Thermes, Tel: +33(0)561 643395. This Italian style restaurant specialisies in pizzas. Traditional restaurant with local food and ingredients. Mentioned in the “Guide Routard”. Outdoor terrace. Gastro pub specialising in French cuisine. Speciality is the huge “Cassoulet” they serve up. Does great salads. Good food and service and has outdoor seating and take away service. Located in the hotel of the same name in the centre of Ax Les Thermes with a large outdoor terrace, this restaurant offer traditional and mountain cuisine such as Tartiflette, Raclette and casseroles as well as grilled meats and numerous gratins. Open daily in high season and Wednesday to Monday in low season for lunch and dinner. French cuisine served in a Bistro – Brasserie - Pizzeria. Open daily with set menus and a children’s’ menu. Serves up pizzas, Tartiflette, ice creams. Good service with a smile, Try the hot –pot of Banana flambé. Specialities include: Ariège Raclette, Fondu and Savoyard Raclette. Seafood on Friday and Sunday night. Ave de la Griolle, 09110 Ax Le Thermes. Traditional French food in the centre of Ax Les Thermes. This Brasserie restaurant doubles as a café bar in the evenings. Fast food restaurant that does home delivery. Specialises in mountain pies and tarts. Has an outdoor covered terrace. Fast food restaurant that does home delivery. 13, Ave Théophile Delacassé, 09110 Ax Les Thermes. Tel: +33(0)561 642204. Allées Paul Salette, 09110 Ax Les Thermes. Tel: +33(0)561 014031. This Bistro – Brasserie – Pizzeria also functions as a bar in the evenings. Good service with a smile. This brasserie restaurant on the slopes doubles as a great cocktail bar/pub in the evenings. Place du Breilh, 09110 Ax Les Thermes. Located in the hotel of the same name in the centre of Ax Les Thermes with a large outdoor terrace, this restaurant doubles as a café - bar in the evenings. Promenade Paul Salette, 09110 Ax Les Thermes. The atmosphere is always one of laid back and welcoming in this late night haunt. Located under the casino with free entry not only for girls but men too. Private taxi transfers from airports to Ax Les Thermes are pre-bookable via Pyrenees Collection. See our Airport Transfer page for more information. Zone Activite de Castelet. 09110 Perles et Castelet, Ax valley. 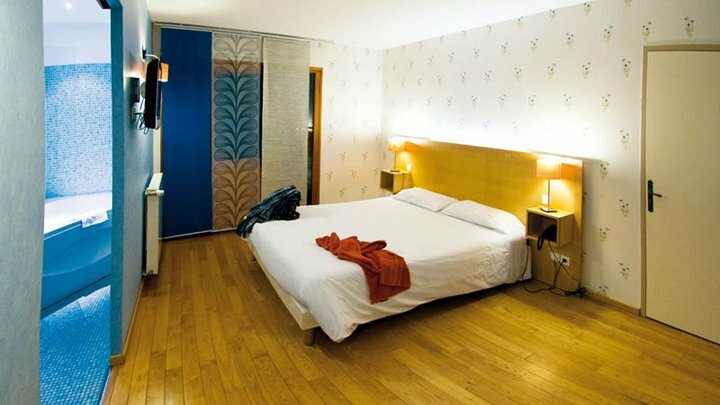 Located just 10 minutes from the centre of Ax les Thermes. Mon – Sat: 08.00 – 20.00 and Sun morning. Savignac Les ormeaux. Ax valley. Located just 10 minutes from the centre of Ax les Thermes. Mon – Sat: 09.00 – 19.30 and Sun: 09.00 – 12.30. 10, Rue Gaspard Astrie, 09110 Ax Les Thermes. 9, Place du Marché, 09110 Ax Les Thermes. 1, Rue De L’Horloge, 09110 Ax Les Thermes. 5, Rue Gaspard Astrie, 09110 Ax Les Thermes. 1, Ave Docteur Francois Gomma, 09110 Ax Les Thermes. 9, Place Roussel, 09110 Ax Les Thermes. 29, Ave Théophile Delacassé, 09110 Ax Les Thermes. Place Du Breih, 09110 Ax Les Thermes. 4, Rue Horloge, 09110 Ax Les Thermes. 7, Ave Théophile Delacassé, 09110 Ax Les Thermes. Rue Moulinas, 09110 Ax Les Thermes. 28, Rue Francois Mansart, 09110 Ax Les Thermes. Place Saint Jerome, 09110 Ax Les Thermes. 3, Rue Gaspard Astrie, 09110 Ax Les Thermes. Place Breih, 09110 Ax Les Thermes. Tel: +33(0)561 022400. 9, Rue de Moulins, 09110 Ax Les Thermes. Boulevard Oriege, 09110 Ax Les Thermes. 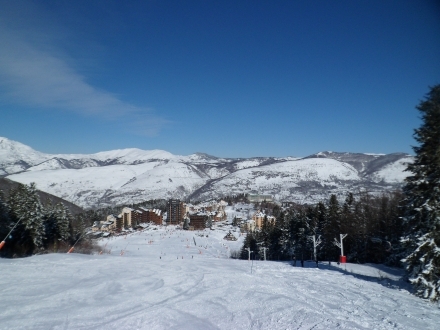 The ski resort of Ax 3 Domaines (known as Ax Bonascre until 2001 when the ski area changed its name to “Ax 3 Domaines”) is situated in the Ariège department, in the Midi-Pyrénées. The ski resort, which is situated 8 kilometres from the town of Ax les Thermes at a height of 1380 meters, opened in December 1955. 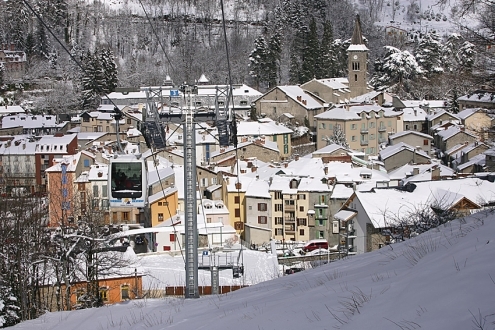 It was only in 2002 that the village of Ax les Thermes and the ski area were connected via the 16 person cable car that runs from the Ax valley up to the heights of Ax Bonascre. Ax 3 Domaines can be also accessed from the same mountain road which leaves from the pretty Pyrenean spa town of Ax Les Thermes. A shuttle bus runs from outside the Tourist Office of Ax Les Thermes, visiting both areas (see Access section for more details). In 2009 a solitary 5 kilometre cross country ski run was created. There are however, the two cross country areas of Chioula and Beille further down the valley. The resort also features a small snow park, 1 snow shoe trail and a 3km pedestrian path and has 195 strategically placed snow canons to ensure great snow coverage at all times. At the end of 2012 it was the first ski station in France to be placed on Google Street view – giving you the chance to see the slopes and runs of the resort from above. 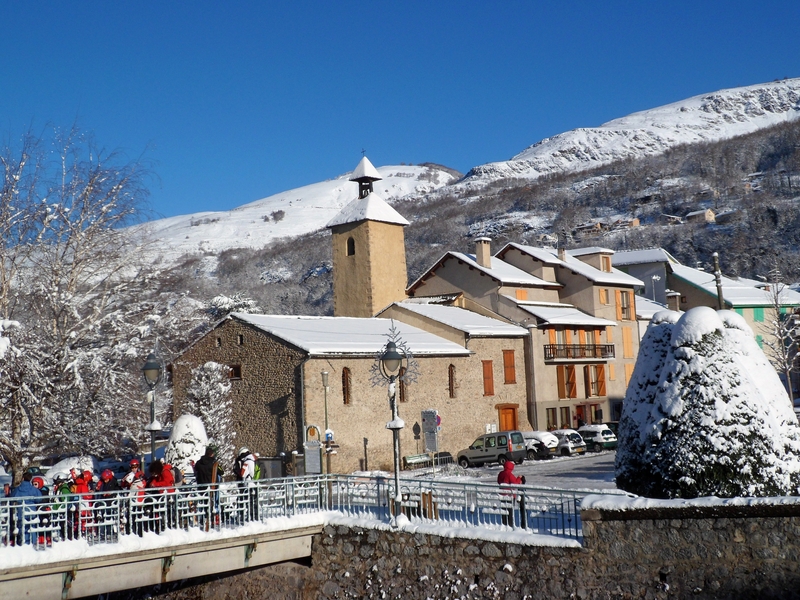 Ax has plenty to offer mixed-ability family groups and recreational skiers who appreciate a relaxed experience and the most beautiful panoramas of the Ariège Pyrenees. With safe areas for beginners and children, Ax 3 Domaines with its even mix of cruising blues to sweep down and rolling red runs is also great for intermediates. There is also a decent selection of black runs for the experienced skier too as well as some great off piste. Leave your car in the valley during your stay and take the shuttle bus to the slopes. During the French school holidays and weekends there is a resort shuttle bus that loops around the village. Bazerques roundabout in Ax les Thermes – Ax campsite – Railway station – Ax Les Thermes cable car. Note: Please contact the Tourist Information office for times and prices. Leave your bags and ski equipment at the secure store lockers at the top of the “Ax Les Thermes” gondola. Price: 1€ per day per locker. 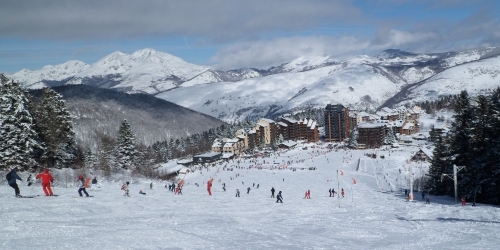 The ski area is split into three distinct areas - Bonascre at low altitude is named after the Plateau de Bonascre (Bonascre plateau), Saquet at medium altitude is named after Le Pic Saquet (Saquet peak) and Campels at high altitude named after La Jasse de Campels” (a small valley to the south west of the Saquet summit). Together these three linked areas offer 80 kilometres of prepared ski slopes in a secure area. The Bonascre plateau is located 1390 meters and is one kilometre long and 450 metres wide. Bonascre was the first of the three ski areas and it is the entrance point to the Ax 3 domaines ski area. It starts at 1,400m with the Bonascre cable car or high speed Lievre Blanc taking you to the top of this area (2,000m). Most of the area is covered by the Crémade and Manseille woods which both make up the main forest area of Ax-les-Thermes. 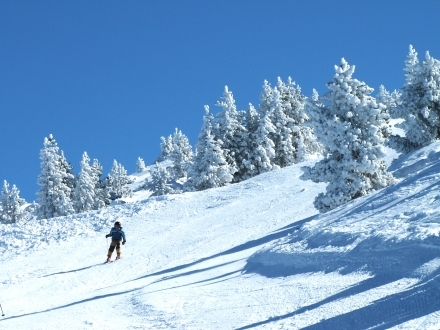 It is therefore not surprising that many of the runs in this area are amongst the pines trees and are a mixture of shady green and blue runs – perfect for beginners and low intermediates. A dedicated beginner’s area is situated at the base of the Bonascre area and comprises of 4 pistes served by 3 lifts. Once you’ve got to grips with your technique and mastered the beginner’s area and you feel ready to take on your first green piste, the best option is to take the Cable car up to the Boulevard de la griole bas green run where you can practise your snow plough to your heart’s content. It is a good half hour to get down from top to bottom. When you are ready to face the next challenge of your first blue run, the best place to head is the Lusclade drag lift to the top of the run of the same name or the top of the Bonascre area which has the best selection of blues. The high speed six man chair lift of the Lievre Blanc will ensure that you get the maximum amount of time to practice your technique on the long and lazy tree lined pistes of Manseille, Sapins or Bonascre. 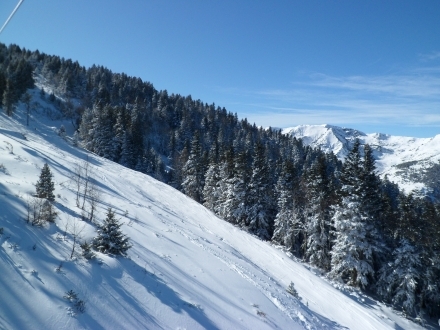 The three blue runs are all interconnected so you need to pay attention to where you are going in order to arrive back at the foot of the high speed Lievre Blanc – only the Sapins run brings you directly back here – the other two take you back to the beginner’s area. There are a good proportion of red-graded runs, in easy open areas, providing a confidence-building upgrade path for those who are ready to graduate from the long blue cruisers. Try the long, sweeping red descents under the Orry and Rebenty lifts in the Campels area. 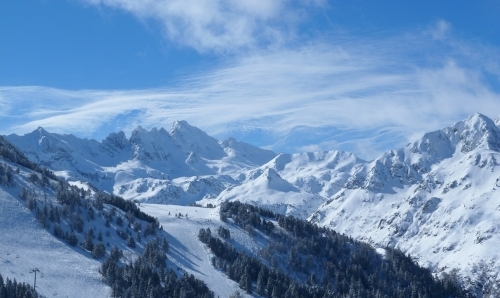 The Bonascre and Saquet areas are well suited to intermediate skiers with a good selection of blue and red runs. There are also some connecting blue runs from the Saquet area over to Campels where you can find more challenging ski runs. For a Grand Tour of the ski area, the 850-metre vertical descent from the top of Tute de L’Ours to Bonascre is great fun. Taking in green and blue runs, this mammoth leg burner starts on the Savis run from the top of the Tute or Ours lift and crosses over into the Campels area, taking in the outer regions of the ski area. It then heads down to the bottom of the Rebenty and Savis lifts where it joins the 3 Jasses green run through the forest and back into Bonascre. If you are higher intermediate, you may want to try the couple of reds in the Saquet area; the Tute or Ours lifts take you to the top of the area where the views across to the Ariege and Andorran peaks are spectacular. More advanced intermediate skiers can try the Campels area, with its predominantly red and black pistes. It offers great terrain where you can enjoy the scenic runs and take advantage of the safe areas between them to perfect your powder technique. For expert skiers the ski area has a handful of great black runs to go at – all of these runs allow for some on piste off piste skiing as you head down them. In the Campels area at the top of the Rebenty lift there are a couple of blacks. The first is the Couillade run which peels off the lift to the left and heads out along the ridge – from here there are some amazing views of the whole upper ski area. It then descends, taking in the outer limits of the ski area, running parallel to the Combes red run into which it finally feeds. The short but sweet Mur (aptly named the wall) run is to the right at the top of the same lift and takes in a steep wall on the upper part and then joins the red run called Berger. In the Saquet area, the Tute lift gives you access to an amazing black run down the left side of the Tote de L’Ours Mountain with spectacular views of the Savignac valley below you. You can take the long sweeping Olympic black run which begins at the top of the Saquet area (off the Tute or Ours lift) and then crosses over into the Campels ski area winding under the Rebenty lift. This one can be great after a powder dump with miles and miles of winding slope to get your teeth into. Mansèdre is the only real black run which is amongst the trees – obviously great on the poor weather days. For those that like to experiment with the off piste, the Ax 3 Domaines ski area is actually quite interesting for lift served off piste. The Campels area with its wild and open areas lends itself well to off piste. Head up to the top of the Couillarde de Llerbes peak for some serious powder. 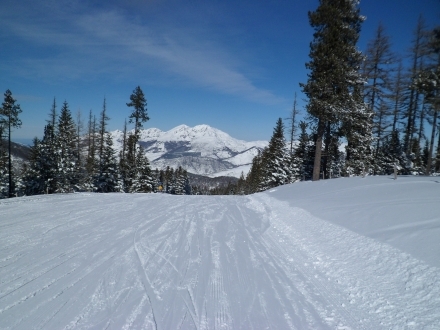 The safe areas between and to the side of these runs are excellent for perfecting your technique if you are not a serious skier/border. The Campels area, with its predominantly red and black pistes, offers great terrain where you can enjoy the scenic runs and take advantage of the safe areas between them to perfect your powder technique. At the heart of the resort, on the Saquet plateau is The NFP (Natural Forest Snow Park) which offers riders a decked area, secure, and easy to discover or improve his technique. The park features numerous jumps, jibs and rails and also has a boarder cross area. You can have a go practising your big air jumps on the huge airbag installed on the slopes. The air bag is opened to the public on Saturdays and Sundays and daily during the school holidays (afternoons only). Chioula Nordic Area. Tel: +33 (0)561 642000. www.chioula.fr. Located just 10km away from Ax Les Thermes and offers 60km of cross country trails set in untouched nature as well as 10km of snow shoeing trails. It is located at a modest altitude and has a small restaurant called “Alvaro” where you can buy hot chocolates, or a good pancake. For those wishing to overnight and wake up with the sunrise to a magnificent snowy panorama, there is a mountain refuge. (Tel: +33 (0)561 640697. www.refugeduchioula.com). Beille Nordic Area. Tel: +33 (0)534 093535. www.beille.fr. A great option but is a little further away, located 30km from Ax Les Thermes. This area is distinguished by its immense high mountain plateau suspended at an altitude of 1,800 and 2,000m. Here you will find 70km of cross country trails and 30km of snow shoeing trails. We have a conveniently located hire shop in Ax Les Thermes for all your ski and snowboard equipment needs. We offer competitive prices and special offers are also available. Pre-booking your equipment hire will allow you to save precious skiing time once in the resort and means you can budget for your ski holiday, knowing that it is already book and paid for. Lift pass give you access to the whole of the Ax 3 Domaines ski area. *FAMILY OFFER: applies to a minimum of 4 people (2 adults + at least 2 children under 18yrs) when proof of direct family affiliation & co- residence can be provided. Proof of age is required for Child, Junior, Student & Free passes; please bring ID when collecting your lift passes. No Photo required. Our prices are calculated at the exchange rate that applies when our currency is bought. We cannot always guarantee that prices will be cheaper than in resort but you can be assured that if the pound depreciates, you will not be charged more for your equipment, enabling you to budget for your holiday at the time of booking. ESF Ax 3 Domaines and its qualified instructors are ready to welcome you to in the Catalan Pyrenees and help you discover the joy of skiing. The French Ski School Ax 3 Domaines was created in 1955. Today the ski instructors are at your service to help you discover the joys of skiing in an exceptional location in the heart of the Ax valley. Passionate about their work, our state qualified professionals teach adults and children in all existing disciplines: skiing, snowboarding, Nordic skiing, Handiski (for disabled skiers). The E.S.F also organises downhill courses and training in disciplines such as Giant Slalom, Special Slalom, Parallel Slalom and Boarder Cross. To meet demand for increasingly diverse, our instructors speak several languages: English and Spanish as well as French, of course! Ski School ESF - lessons only, lift passes not included. 07/02-07/03: 12:00 and 13:00 – 15:00 or 15:00 – 17:00. The group lessons which are available for both children (aged 4 years and over) last 2 hours per lesson and are available on a daily basis or a 6 consecutive days basis beginning on a Sunday. The levels are shown below. February school holidays: 10:00 – 12:00 and 13:00 – 15:00 or 15:00 – 17:00. This Children’s skiing club caters for children from 4 – 12 years of age. The children learn to ski through playing and enjoyment and use specially equipped tow ropes to take them up the small baby slopes. The classes last 2 hours per lesson and are available on a daily basis or a 6 consecutive days basis beginning on a Sunday. The levels are shown below. Even the little ones can have a go - the ski instructors take out 3 – 4 year old into a secured snow area which is specially designed for fun and has a rope tow. The classes last 2 hours per lesson and are available on a daily basis or a 6 consecutive days basis beginning on a Sunday. There is a minimum of 5 children per class. The levels are shown below. Ski & Nursery packages are available. Available daily from 09:00 – 17:00 with a ski instructor of your choice (availability dependant) private lessons give a one to one experience for personalised tuition at whichever level you choose. You can also take a private lesson for a group of up to 4 people, however you must all be at a similar level of skiing for this option to function. For Handicapped adults or children who would like to discover the ski area on a tandem ski there are 3 ski instructors qualified to help you discover the delights of skiing. An individual package adapted to the person's needs is available for 2 hour or more each day and includes a Tandem ski. 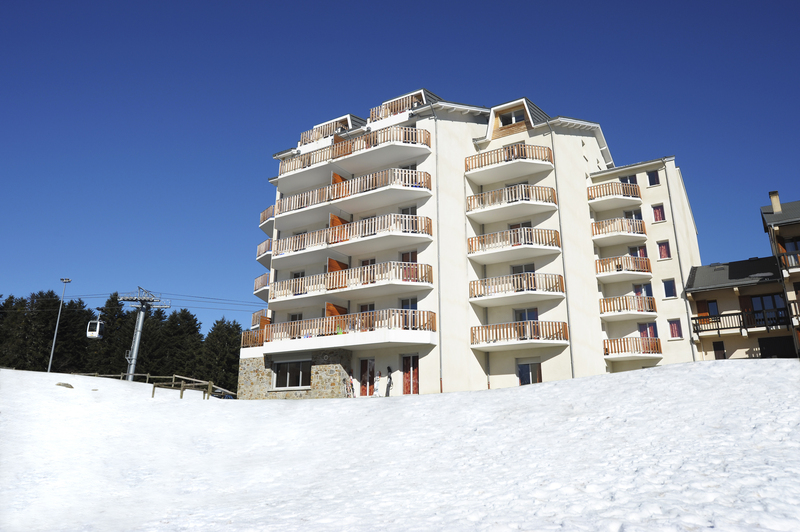 A recently-built residence in the centre of Ax, it is ideally located next to the cable car that accesses the ski area of Ax 3 Domaines and is just 50m from the village centre's restaurants and bars. This family-run gastro-hotel is centrally situated in the pretty spa town of Ax les Thermes. Contemporary-styled, the hotel is close to the Bonascre gondola that accesses the Ax 3 Domaines ski area. A recently built, modern residence located in the pretty spa village of Ax les Thermes, just a short walk from the village centre and the Bonascre gondola that accesses the Ax 3 Domaines ski area. This modern hotel residence on the main square is ideally located opposite the “Bains de Coullioure” thermal spa and just 300m from the gondola cable car that accesses the Ax 3 Domaines ski area.